Kwicksilver has a new chroming method based on physical vapor deposition (PVD). It is 100% environmentally friendly, using no hazardous materials and producing no hazardous waste. Better still, is has a 5 year warranty (typical chrome is 1 year), will not oxidize under winter conditions, and is 80% lighter than chrome. It is offered in traditional bright finish (ice) and a darker finish (black ice). 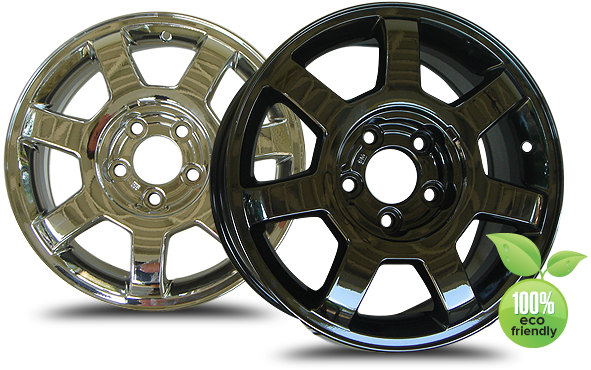 Many times we are able to offer a “PVD chrome exchange” whereby we order in a set of PVD chrome plated wheels that match your existing standard finished rims. When they come in, we schedule an appointment for us to switch your tires and tire pressure monitoring sensors to the new wheels. We then send your standard finished wheels back to be PVD chrome plated and placed on the shelf awaiting the next customer.